In the spring of 1939, the Nazi propaganda machine broke the news that an aircraft designated Messerschmitt Me 109R had set a new world air speed record of 469.22 mph. The designation fostered the impression that the machine was a variant of Germany’s new single-seat monoplane fighter, the Messerschmitt Bf 109. 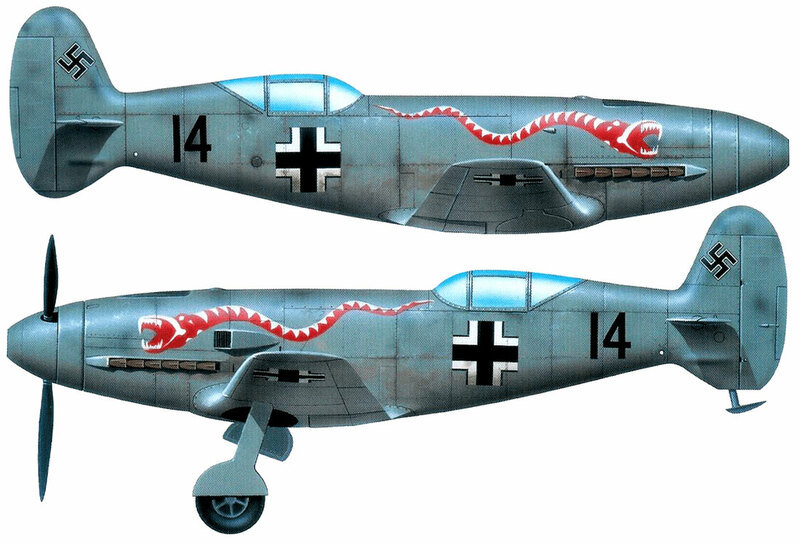 In fact, the “Me 109R” was the prototype of an entirely new aircraft, developed for the specific purpose of attacking the record. Its correct designation was Me 209V1, and it was one of the most dangerous aircraft ever built. Developed at Messerschmitt’s Augsburg factory, the Me 209 was a small, low-wing monoplane designed around a specially engineered Daimler-Benz DB 601ARJ twelve-cylinder inverted-vee liquid-cooled engine, which gave 1800 hp and could be boosted to 2300 hp for short periods. The airframe was kept as small as possible and equipment reduced to the absolute minimum. The pilot’s cockpit was set well aft, the fin had a large ventral section, and the tailplane and elevators were very small in area. The wide-track undercarriage comprised two main members, retracting inwards into the wing and fuselage centre section, and a tailskid was fitted to the ventral fin. In order to reduce drag to an absolute minimum, radiators were eliminated by introducing an engine evaporative cooling system. After passing around the engine, the water coolant was piped out to the wings, where it was cooled by partial evaporation through holes in the skin and then passed back into circulation. Because the system entailed a constant loss of water, at least 200 litres (44 gallons) had to be carried on each flight, even though the engine could not be run for more than 30 minutes at a time. 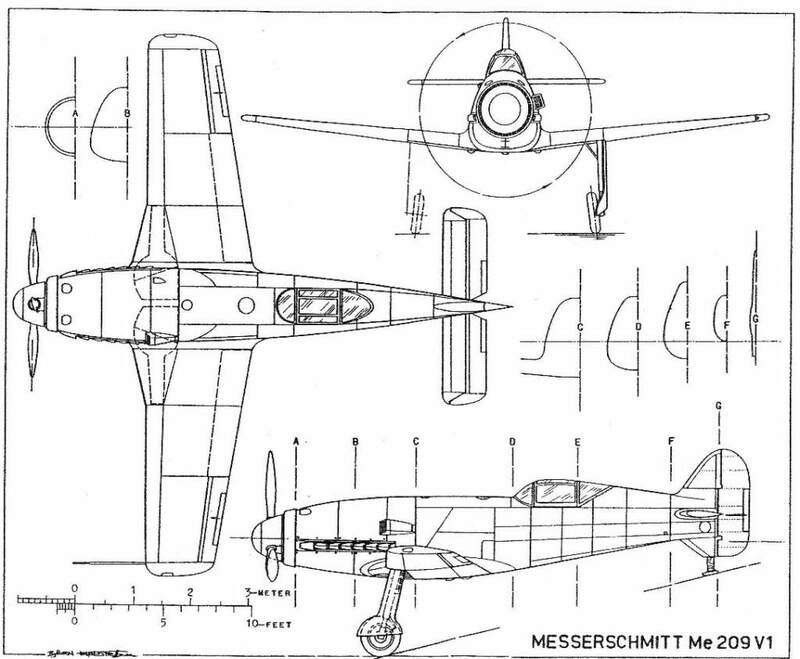 The design bore the Messerschmitt project number P.1059. The prototype, which also carried the civil registration D-INJR and the Werknummer (Factory Number) 1185, flew for the first time on 1 August 1938, the pilot being Dr J.H. Wurster, who was then both chief engineer and chief test pilot at Augsburg. Some unpleasant characteristics became apparent from the beginning, notably the aircraft’s tendency to nose down with no warning and for no apparent reason. The controls were heavy and unwieldy, the aircraft was generally unstable in flight, and the sink rate was high during the approach to land, resulting in a heavy touchdown and an inclination to swerve violently. A second aircraft, the Me 209V2, D-IWAH, made its first flight on 4 April 1939. The role of chief test pilot had now been assumed by Flugkapitän Fritz Wendel, leaving Dr Wurster to concentrate on engineering matters. Wendel was less than enthusiastic about the little machine, and later described his impressions of it. In 1937, our Bf 109Bs and Ds had caused a sensation at the Zurich International Flying meeting, winning many of the contests, and much of my early time as Chief Test Pilot was devoted to testing variants of this aircraft. Many an unkind word has been said about the flight characteristics of this little beauty, but it was a lady all through when compared to that winged horror with which I gained the world air speed record. Adolf Hitler was determined that Germany should hold any and every aviation record, and he was particularly anxious that we should gain the absolute speed record. At that time the record had been established by Francesco Agello in a Macchi MC.72 seaplane at 440.7 mph. My predecessor, Dr Wurster, had raised the international landplane speed record to 379.39 mph on November 11, 1937, in a DB 600-powered Bf 109, but we were after the absolute record, and the result was the Me 209. With its tiny wing and, for those days, horrifying wing loading, the 209 was a brute. Its flying characteristics still make me shudder. It had a dangerous tendency to nose down without any reason or warning, and it touched down on the runway like a ton of bricks. Even on the ground its characteristics were no more ladylike, as it would suddenly swerve off the runway without any provocation. The first prototype, the Me 209V1, was initially fitted with a standard 1075 hp Daimler-Benz DB 601A in order to get some idea of the aircraft’s flight characteristics before installing the specially souped-up engine for the record flight. This special engine delivered about 2300 hp for a short burst and then … a new engine! Cooling presented Messerschmitt and the Daimler-Benz boys with a peach of a problem. Had orthodox radiators been fitted their drag would have seriously affected the plane’s speed. Therefore, a surface evaporation cooling system was worked out. We knew that the working life of this souped-up engine would be but half an hour at the very most, and the engineers commandeered all the available space in the plane – which wasn’t much – for water tanks. The water was run through the engine, out into the wing, condensed, and then back into the discharger. About one and a half gallons of water were consumed every minute of flying time, and the plane left a long trail of steam behind it! On 4 April 1939, I took off for a training flight in preparation for the speed record attempt in the second prototype, the Me 209V2. After a few tiring minutes of heaving the unwieldy controls, I turned in for a landing approach. I was accustomed to lowering the undercarriage as I reached the Siebentischwald, a forest near the airfield at Haunstetten, but on that day, without warning (everything happened without warning in the Me 209) the lubricating system packed up, and immediately the pistons were grinding in the cylinders and the airscrew was standing as stiff as a poker. With a hell of a jolt, the plane virtually pulled up in mid-air, the result of the combined drag of the lowered undercarriage and the unfeathered airscrew. The vicious little brute started dropping like a stone, and below me was that damned forest. I strained on the stick with all I had and, to my surprise, the plane responded. I screamed over the last row of trees bordering the Haunstetterstrasse, and was even more surprised to find myself staggering away, relatively unhurt, from the heap of twisted metal that seconds before had been an Me 209. A few days before this crash, on 30 March, Heinkel’s test pilot, Hans Dieterle, captured the absolute speed record at 463.92 mph in our major competitor, the He 100V-8. So we had been forced to set our sights higher, and we knew that if we did raise the record still further it would be marginal. On 26 April 1939, only twenty-two days after my crash, I climbed into the cockpit of the blue-painted Me 209V1, now fitted with the souped-up engine, for an attempt to beat Dieterle. The engine sparked into life with its characteristic roar. A very brief warm-up, a last instrument check, and I was off, searing up and down the course and screeching round the clearly marked turning points. I touched down again and saw a crowd of workers and technicians racing towards the plane. I climbed out of the cockpit, and Willi Messerschmitt slapped me on the back and told me that we had ‘got it’. 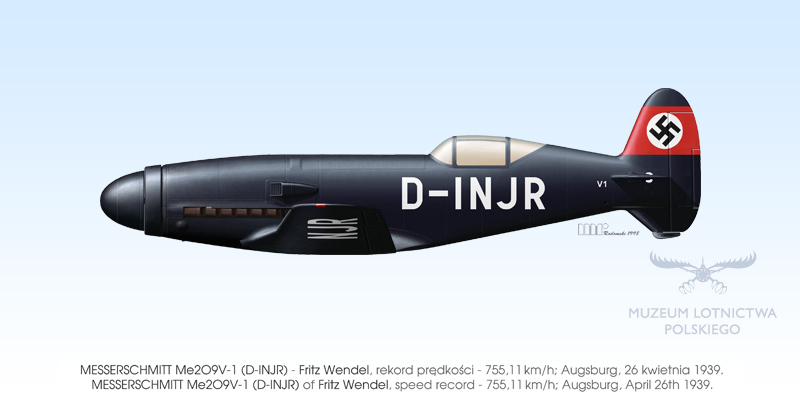 The Me 209, as I was to discover later, had averaged 469.22 mph. Originally, it had been intended that the record attempt would be made by the third prototype Me 209, the V3 (D-IVFP, Werknummer 1187), but as this was not ready in time the V1 was used instead. The record was to stand for thirty years, until 16 August 1969, when it was beaten by American pilot Darryl G. Greenamyer, who achieved an average speed of 482.533 mph in his Grumman F8F-2 Bearcat, Conquest I. The Me 209V3 eventually flew at the end of May 1939 and was used for experimental flying. With the coming of war in September 1939 all thoughts of further record-breaking attempts were abandoned, and the fourth prototype Me 209, the V4 (D-IRND, Werknummer 1188) was completed as a fighter. The Me 209V4 first flew on 12 May 1939 and had a redesigned wing with automatic leading edge slats. Provision was made for the installation of two nose-mounted 7.9 mm MG 17 machine-guns and one 30 mm MK 108 cannon (at a later date, an attempt was made to install two additional MK 108 cannon in the wings). After eight test flights the surface evaporation cooling system was abandoned in favour of a more orthodox arrangement of underwing radiators; the wing span was progressively increased and the slats were replaced by drooping leading edges. Further flight testing, however, revealed that the Me 209V4 could not attain its original estimated performance expectations and offered no great advantage over the standard Messerschmitt Bf 109. The story of the Me 209, however, had by no means ended. 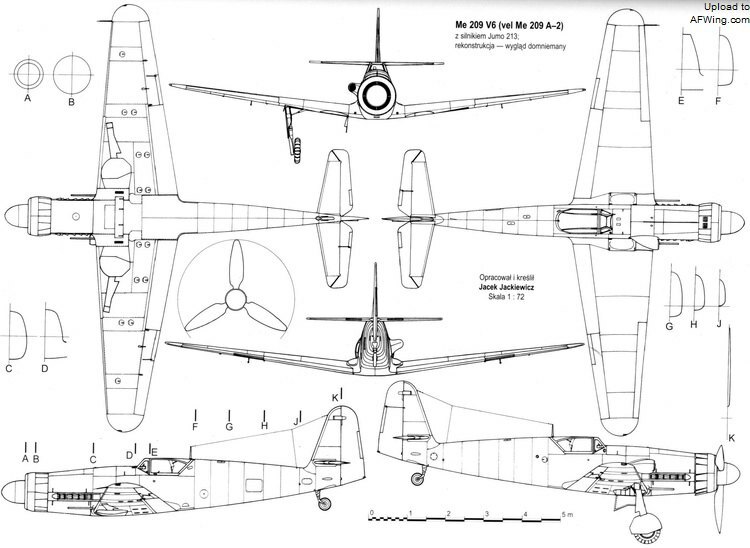 Early in 1941, the Augsburg design team began to study a potential replacement for the Bf 109. 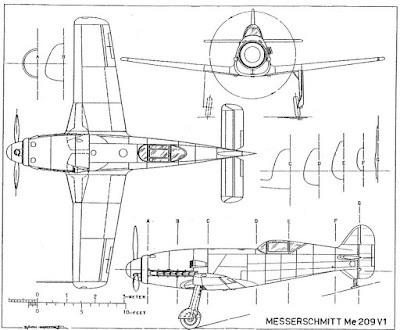 Allocated the designation Me 309, the new fighter was of advanced concept, featuring a pressurised cockpit, tricycle undercarriage and retractable radiator. The new type incorporated a number of lessons learned during the Me 209 development programme, and various features were tested on modified Bf 109s. Because of all the innovations development was slow, and it was not until the end of 1941 that design work was completed. The Me 309 will be acceptable after certain improvements have been effected, but it should be stressed that this fighter will provide the average service pilot with handling difficulties. Control forces are very high by comparison with those of current fighters, and the nosewheel undercarriage is likely to present problems when the fighter uses operational airfields. 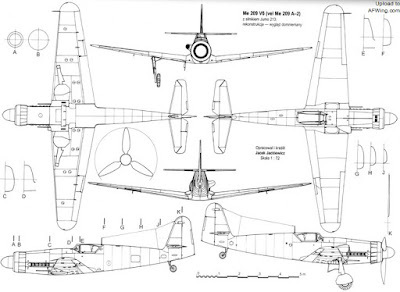 With full armament, the Me 309 will be only some 30 mph faster than the Bf 109G, and there would seem to be no advantage to introducing this fighter when superior types (e.g. the Fw 190D) are already leaving the assembly lines. The second prototype, the Me 309V2, which was intended for high-speed trials, made its first flight on 29 November 1942. It was also its last, because the nosewheel leg collapsed during landing and the aircraft was damaged beyond repair. The test programme planned for the V2 could therefore not be implemented until the completion of the Me 309V3 in March 1943, by which time the radical Me 262 jet fighter was undergoing flight trials. The Me 309V3 was assigned to the Me 262 programme, testing cockpit pressurisation systems and ejector seats.